I had so much fun with my last book review that I decided to do another one. Who knows, maybe it will become “a thing.” Whatever that means. You may scratch your head on this one. 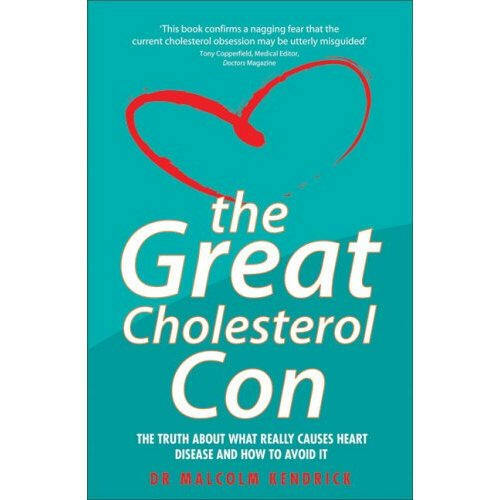 The review is on a book entitled “The Great Cholesterol Con: The Truth About What Really Causes Heart Disease and How to Avoid it,” by Dr. Malcolm Kendrick. So, why would the Catholic Diatriber review this book? Primarily, the easy answer is “because I feel like it.” But why not do so on the “Personal Diatribes” blog? Well, I don’t really post there much, and it’s really meant to be a site for anecdotes and family stories and such. Though, not exclusively so. Actually, I am posting it here because this is where I do the majority of my posts, and also because we Catholics don’t just concern ourselves with purely spiritual matters. If we find something that can prove helpful to others, then we assist. And so, in the area of health information, I think it’s a quite Catholic thing to do to share a few lay insights into my take on Dr. Kendrick’s little book. By way of a bit of background, my wife and I both have what I believe to be some healthy skepticism towards consensus on matters where consensus tends to shout down dissenting views. And to the extent I am a little skeptical, my wife tends to default to that view especially in areas of health. But this comes with a good dose of her seeming to be generally right, so I seldom argue. That said, I will tend to roll my eyes at some of the things she reads, and my initial reaction to this book was to do the same. Before I picked it up, the title alone struck me as a bit sensational and alarmist – kind of like those e-mails one gets with all sorts of huge, red, bolded letters with a lot of exclamation points. You know the ones – where if you don’t forward it to 800 other people then you hate America or want children to suffer or don’t love Jesus, or whatever the case may be. I can’t even remember what prompted me to actually pick it up and start reading it. But I was actually shocked as I read it… not so much as to any claims or content, but that it was incredibly sensibly written, humorous, and fully referenced. As difficult as it may be to believe, it truly is written with a sense of humor. In my opinion this adds credibility. Too many “Exposed!” books are all about demagoguery and written with a great sense of foreboding and conspiracy. A couple of random examples of a little humor that helped make the book eminently readable follow. There are so many ways in which this analogy is wrong, that I just can’t possibly outline them all here. Hopefully, by the time you have finished this book you will understand that anyone making such a statement needs to be taken out and slapped repeatedly with a we kipper. …my memory of a traditional Scots recipe is, as follows: Step one: Place a three-pound lump of beef in a saucepan with a carrot and an onion and boil for eight hours. Step two: Eat with boiled potatoes. And as everyone knows, the Scots love a fry-up. Even a fried-up Mars bar: Step one: Take a frozen Mars bar and cover in batter. Place in deep-fat fryer for two minutes. Step two: Eat with chips while walking home in the rain. None of those quotes are particularly relevant as far as content goes, but I thought they were funny so I felt like quoting them. There are many other such things that kept it entertaining. Of course, humor is all well and good, but it is not the purpose of the book. So, how did I feel like it held up where actually important: making a case for what Dr. Kendrick considers to be the “con”? This book is really just written more from the point of view that the consensus is simply wrong. Oh, sure, there are a few little potshots here and there as to the motives of some, but that is not the focus of the book. This may seem a bit surprising, given the title, which would lead one to think it’s about uncovering some great conspiracy. This isn’t really a case about conspiracy as it is about groupthink and an inability to see the forest through the trees. The author recognizes that certain things just seem so logical to the establishment that they “must be true,” and are so compelling that those studying the question cannot seem to alter their course even when studies show contradictory results. Instead, the underlying premise is assumed correct while they study certain aspects of the studied group and then provide reasons for why the study showed different results without having it affect the initial hypothesis, even when that is the simpler and more realistic answer. Some of this is certainly profit-driven, and there is a real question about ties to pharmaceutical companies among other valid observations. But the main point seems to be that good and well-meaning people just plain have it wrong, whatever the reasons for it. I am a math guy and have studied my share of science. I am not an expert in bio-health, so I cannot state with certainty much of anything. What I can tell, I believe, is whether or not somebody is sourcing their material validly and making a strong case. I can also tell if there’s a sincerity to the opinion, or whether or not this is just a book to alarm and make money. It is my opinion that the book is a valuable read for those with an open mind to questioning the consensus. Certainly, it should not be viewed as the be-all and end-all, but should promote further questions and study. It would take some length to summarize the points of this book, and I may do a follow-up post on that. The point of this post was to simply review the book. I believe I have covered most of what I intended to cover in the review. If I have one critique to the negative, it is that as I read this book I found myself looking forward to the end, where I was sure it would be all laid out for me on exactly what I can do to escape heart disease now that it’s been shown that a lot of those reasons we thought caused it no longer apply. I admit I was disappointed in the conclusion. There certainly were some bullet-points there, and they had been alluded to throughout the book, but it fell quite a bit short in my opinion. It was clear that it was not the emphasis of the author to provide a “how to live your life” book, but to perhaps free us from the chains of thought that are not helping –and may be hurting us and making life more miserable than it needs to be. But a little bit more in the suggestions would have made the book feel more complete, as opposed to feeling like the author just wanted to end it after he was done with what he was really actually interested in. Recommendation: If you eschew these kinds of books for any of the following reasons: (1) they are dry and boring; (2) they are over your head; (3) they are alarmist; (4) they are not well-referenced and lack credibility; (5) they are written by quacks who are not doctors and have no relevant experience then you have still not hit on a reason to not read this book. None of those apply. I strongly recommend reading this, if for no other reason than to consider the discussions on Statins and medications and be more informed as to how they work and better understand the total mortality concept instead of just focusing on heart disease. Read and enjoy, but make your own decisions. One thing I’d like to do a bit more is review some of the books I read. I don’t read a gazillion of them, but I do like to share my thoughts on them when I do. 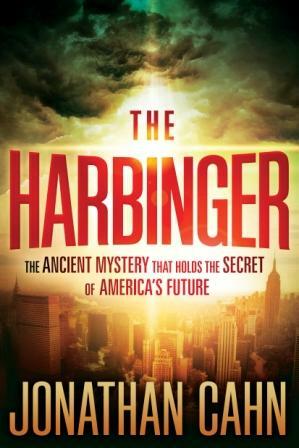 I am going to start with a book I just finished: The Harbinger, by author Jonathan Cahn. Mr. Cahn is the leader of Hope of the World Ministries, an evangelical outreach organization. I do not purchase many new books. Having a large family and trying to maintain a budget, I usually check with my library first for my leisure reading. When I either cannot find it from the library (often enough for religious/spiritual books) or decide I want to own it, the title goes on my wish list for birthdays or Christmas. If I don’t want to wait, then I look for good deals on used copies on Amazon or elsewhere. The Harbinger was an exception. Touted heavily on World Net Daily, and also featured on Spirit Daily (a Catholic-based news site), my interest was heightened to the point where I decided to buy the book new. I almost feel bad about the review I’m about to give, because it is not favorable. So before I go there, let me differentiate between the book itself and the book’s insights and message. The entire prophetic insight is a tying of what is happening in America today to what occurred long ago in ancient Israel, and in particular centered about the hard-hearted response of the nation of Israel in Isaiah 9:10. There are some very interesting parallels that are presented in the book. For the most part, these things are thought-provoking and worthy of study and contemplation. The message itself with respect to what is in store for America if there is not repentance for straying from God is spot on, as well. All those aspects of the book are worthy of note and generally a good thing. What is not good is the book itself. So, keep those high points in mind as you read the rest of this post. Mr. Cahn decides to present his insights and study of Isaiah 9:10 (and surrounding verses later on) into story form. All that is well and good, but the story serves almost no purpose, and is not remotely entertaining. The book is 253 pages long, 250 pages of which is conversation. Even more frustrating is the incredible thick-headedness of the man at the center of the narrative. The conversations are reduntantly redundant, and no matter how many times a point is made, the main character reacts as if it’s a brand new revelation. The format of the story is that the main character, Nouriel Kaplan, tells his tale to a woman, Ana Goren, who has something to do with publishing or marketing or something that isn’t quite clear. And when I say that he tells his tale, that’s all he does. Oh, they eventually get up and go for a walk to somewhere that is not embellished upon, but their interaction is a conversation. A long one. And what he is telling her is a recounting of his conversations with a Prophet. We never find out the Prophet’s name, through no fault of Mr. Kaplan’s attempts to uncover this detail. Prophet: Here is another seal for you to worry about, and here’s an enigmatic clue as to its meaning, but I’m not going to tell you what it means. You need to figure it out for yourself. After weeks, or months, of investigation, sometimes figuring out nothing, sometimes figuring out only a partial aspect of it, and sometimes thinking he figured it out but not really, the Prophet suddenly appears again and the next encounter ensues. Prophet: Did you figure it out? Kaplan: (a) No. (b) Kind of. (c) I think I did. Prophet: (a) OK. Let me tell you everything. (b) Good, but you’re not really that close. Here, let me tell you everything. (c) Nouriel, you’re on the wrong track. Here, let me tell you everything. One was left wondering the point of all the waiting and wheel-spinning, if the Prophet was just going to spill the beans anyway. Other than to fill up pages with the hopeless pursuit, that is. To the extent that the interesting aspects of what Mr. Cahn has observed were laid out, the background and history were intriguing, and this is clearly the most redeeming aspect of the book. But all of these things could have been covered, even with relatively extensive commentary, in 50 pages or less. Quite honestly, I found myself forcing my way through it many times just to get to the next relevant part, and at some points I was outright wishing we could just get it all over with. I would have much preferred something other than a forced story that really wasn’t much of a story. A commentary by Mr. Cahn just providing the scholarship behind his observations and insights and the history that accompanies it would have simply been much better, much more concise, and interesting. If wanting to provide it in terms of a fictional story, then a book-long conversation that made you want to smack Mr. Kaplan upside the head and say “How do you not know the answer to that question yet, you moron?” wasn’t the way to go. I don’t pretend to offer an example of how one would have actually written a story where actors are playing it all out and discovering these ancient mysteries along the way, but almost anything would have been better than a book-long account of a reporter recording a very wordy prophet saying the same thing in a dozen different ways. Mr. Cahn also cannot resist interjecting a little outright evangelization at the end, which is fine as far as that goes. As a Catholic, it is easy to recognize that he is not one, and we do see some of the “it’s about faith, not religion” pronouncements from the Prophet that are a bit problematic, as if the two things are not in any way compatible. But quite honestly, that whole chapter has nothing at all to do with the insights of Isaiah 9:10. It simply reminds us that no matter what happens to nation or peoples, we still have to account for ourselves, which at the heart of things is a fine message. But again, it’s just all a long conversation. So, I realize this sounds a bit harsh. I admit to being disappointed with the book. But my disappointment is almost more in what I perceive as a lost opportunity. You see, I actually do think that it’s worth understanding what it is that Mr. Cahn sees. I think there are some stretches, as far as a couple of his “harbingers” go (I mean, really… the “vow” made by a failed VP candidate in 2004, regardless of where or how he said it, just doesn’t seem to be nearly as alarming as Mr. Cahn apparently believes it is), but having said that there are remarkable parallels that he has uncovered that, at the very least, make you go “hmmmm.” But the problem is that the book itself is so overly verbose, and – quite honestly – boring, that you lose the excitement of some of these interesting elements. And I’m someone who really enjoys reading this kind of stuff. I have seen that some donor has decided to send a copy of this book to everyone in Congress. That’s all fine and dandy, but the travesty of it is that I am almost certain that someone who might otherwise be interested in and appreciate a more concise and/or entertaining approach towards sharing the insights around Isaiah 9:10, but who is not necessarily a person of strong faith or is not inclined towards the prophetic, will be utterly bored with this book before it even gets to the point of shedding light on some of the more important areas of consideration. And that is, itself, a missed opportunity and a bit of a travesty. Recommendation: If you can borrow this book, or check it out at a library, it’s worth the time to scan through and pick up on the interesting parts. If you want to read the whole thing, go for it, but you really aren’t missing anything by skipping over a lot of the filler. Preferably, assign it to your kids as a book report and make them summarize it for you. Originally posted on http://digitaldiatribes.wordpress.com on February 28, 2008. Part One of my discussion on Catholic Prophecy is here, but before I delve into too much information on the subject, I want to make one thing clear. I claim very few of the insights as my own. I have read a number of resources that have shaped my opinions, and much of what I am going to write on the subject of Catholic Prophecy are from notes I have taken over the course of a number of years. So, I may well be re-stating something in a way that has been stated in someone else’s work, without explicit accreditation. At the very least, I owe my sources the courtesy of being up-front about that, and listing the texts I have read on the subject. First, it goes without saying that the Holy Bible (RSV, NAB, New Jerusalem) is a primary source. The text of Scripture itself is key, but so are the explanatory footnotes. Also, the Catechism of the Catholic Church, while it does not delve into the subject matter greatly, holds a few very key teachings regarding eschatology and its proper Biblical interpretation.